Former TVB actress Fala Chen (陳法拉) has officially started work for the HBO limited miniseries, The Undoing. The 37-year-old actress, who left TVB in 2013, will be starring alongside Nicole Kidman, Hugh Grant, Donald Sutherland, and A Quiet Place child star Noah Jupe in the HBO series, which is about a successful working woman and mother who undergoes a life-changing event. According to official sources, The Undoing will be a six-part limited miniseries, with Fala appearing in four of the episodes as Jolene. Directed by Susanne Bier, the series is based on the book You Should Have Known written by Jean Hanff Korelitz. Fala was spotted in New York City this week to film the show, alongside Nicole Kidman. The Undoing will be Fala’s debut Hollywood work. She graduated from The Juilliard School in 2018 with a Master of Fine Arts in Drama. Kidman’s presence is stunning even in that photo. Is Fala going to have a big role in the 4 episodes that she will be appearing in the series? There will be 6 episodes all together. @mike I’m still trying to figure out which character Fala will be playing, since the character named (Jolene McCall) is not in the book (as I mentioned earlier, hers is the only character from the series’ cast list that is not in the book, as all the other main / supporting characters are accounted for). 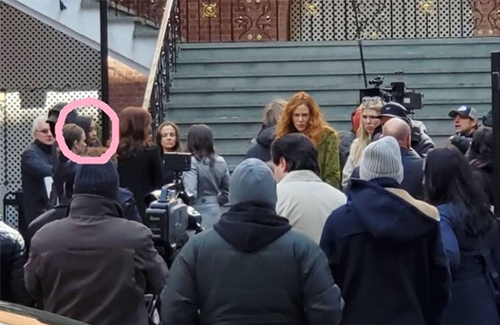 Judging from that picture (and extended video of that scene being filmed that I found on Twitter), I’m guessing perhaps her character is a replacement for one of the other mothers in the book that so far have not been mentioned in the cast list (but then again, 4 out of 6 episodes is quite a bit, even if it’s only a few scenes in each episode, and none of the characters except for the 3 main ones — Nicole, Hugh, and their son played by Noah Jupe — would span across that many episodes like that given the story as it is told in the book). So no, probably not a main character, as all of those characters are already accounted for. I have a feeling the Asian media outlets either got the information wrong or they are exaggerating Fala’s presence in the series (which they can do in Chinese media because most people over there probably aren’t familiar with the story). Either way though, like I said earlier, the good thing is that unlike all the other Chinese actresses (and actors) trying to break into Hollywood, at least this series is a legitimate opportunity for Fala (meaning that it’s a mainstream American series adaptation with big name cast) where she isn’t relegated to playing a “token Asian” or any type of stereotypical Asian character (by the way, there are no Asians in the book and race isn’t a factor at all in the story, so even if Fala’s character was one that was added later, I’m 99.9% sure that part is not going to change given how the story plays out in the book). i concur, it is not going to be a main/significant role. Probably one/two scenes here or there. you’re right, the asian media is eating it up more than it has to but hey, it’s hollywood. any small role could be a foray into something great and wider recognition. even if this is her only role in hollywood, in the papers, they will refer as the show’s star and that’s quite an honor. @m0m0 Yup, exactly. The other reason I think the Chinese media outlets are exaggerating is because I also read entertainment news from the American outlets and whenever they refer to this series, the focus of the reporting is on Nicole Kidman, Hugh Grant, Donald Sutherland (who is playing the father of Nicole’s character) or the kid Noah Jupe. Fala’s name is only mentioned “in passing” – meaning that she is mentioned as being cast in the series and that she is repped by UTA – just like all the other supporting characters in the series. This is why I always say that it’s better to read from a variety of different sources (in both English and Chinese) when it comes to news, as higher likelihood of getting a more balanced perspective…. C-media has a tendency to exaggerate by bestowing the title ‘international star’ to any c-actor/actress who has a minor role in Hollywood. @winnie Same here – I was never fond of her acting either and whether she improved or not remains to be seen (she hasn’t proven herself to me yet in terms of her acting). But one thing I do respect her for is the fact that she knew her acting was bad, but instead of whining about it or attributing it to audiences not liking her (like a few other actresses we know), she actually did something about it by going to Julliard and getting a degree in the discipline. For her to invest that time and energy (not to mention money of course) in pursuing higher education in the craft, it tells me she takes acting seriously and plans to make it a career. And the fact that she decided to branch out after Julliard rather than return to TVB (and put that education to waste in the process if she were to return), made me respect her even more. I’m not a fan of hers and probably never will be, but I’m genuinely happy for her and have no problem supporting her when it comes down to it…. Whether it is a small or big role, Fala Chen needs to start with something in Hollywood if she wants to pursue her career in the west. It is always hard for female Asians to find decent roles in Hollywood, except those typical Asian roles (such as Geisha) or action roles. Anyway, I wish Fala the best in her future endeavours and to achieve success in her career. it’s hard for an asian period. we are just this forgotten quiet race that hangs around.